9) Do we know who we are? We are all originally indigenous peoples from everyplace on earth. 'Indigenous' (Latin = 'self-generating') heritage is hundreds of thousands if not millions of years old. There are remarkable worldwide similarities in 1) three-dimensional orchard-tree polyculture food production in tropical and temperate climate zones, 2) the organisation of labour around domestic economy Multihome living in Longhouse (apartment-like) and Pueblo (townhouse-like) complexes, 3) specialized Production Societies for the provision of goods and services, 4) time-based accounting with the string shell, 5) progressive ownership from youth to elder, 6) women's councils, 7) vision-quest education, 8) circle and council process and 9) formal dialogue processes among individuals at every level of community on every continent. Individuals and the whole people each in their areas of empowered specialty exercise an 'economic' (Greek 'oikos' = 'home' + 'namein' = 'manage' from 'manus' = 'hand' from 'care and nurture') 'democracy' (Greek 'demos' = 'people' + 'kratos' = 'power of') missing from modern political democratic and hierarchic for profit or non-profit corporate or cooperative governance. Indigenous socio-economic technologies form a self-generating constellation of sustainable human relations, culture and natural-science. During the process of colonial destruction of the abundant indigenous three-dimensional orchard for control paradigms in meagre 2-D agriculture, 'exogenous' (L = 'other-generated') peoples began a cycle of conquest. Through empire and adoption of hierarchic false artificial science, humanity has become alienated from our wise indigenous heritage. Listen to Buffy Ste-Marie 'Universal Soldier', http://www.dailymotion.com/video/xbvps_buffy-sainte-marie-universal-soldie_news?ralg=meta2-only#from=playrelon-1 Indigene Community website reconstructs multi-disciplinary indigenous socio-economic technology for re-establishing sustainable human relations in an abundant planet. Our thousands of readers and correspondents come from countries across every inhabited continent on earth. We hope that as a reader wherever you are, you will join us in compiling, celebrating and reanimating your portion of humanity's indigenous heritage. CAVEAT: The 'Indigenous Knowledge' IK research and experience presented on this website is limited. There are tremendous resources on IK available but in bits and pieces worldwide. First Nations, those peoples still identifying with the indigenous name and your own indigenous cultural roots are the best resource for IK (even if they only begin as a whisper). Indigene Community provides some research, interpretation of patterns, formulation of suggested practices and our example of implementing heritage practices for sustainability. We hope this website and Indigene Community can join your and our efforts in welcome, collaboration and abundance for all living creatures. Please join us in this compilation and enactment 'back to the future'. How to Grow Your Own Raw Vegan Food Garden Presented by: Douglas Jack, polyculturalist, Produced by Lawrence Levin, film-maker. D. 'ECONOMIC' from the Greek = 'care and nurture of the home and family' livelihood, design to recognize, account for human resources and support each other in 'livelihood' (food, shelter, clothing, warmth and health) or the process of making a living. Supporting people and life processes are key to reaching our goals together. E. EXPERIMENTAL, progressively establishing scientific understanding and implementing best practices of design in multihome (apartment & condominium) settings. F. FRACTAL, MEME, GENE, organizing fundamental human and natural strengths / properties progressively through individual, family, extended family, community, municipal, city, regional, state or province, nation, continent, hemisphere and world stages. Fractal organisation expressed by Mohandas Gandhi as "Become the change you want to see in the world". Metaphor: three-dimensional "Organizing from the tree-roots" with concerted cell-tissue mass, deep thick penetrating water absorbing roots, high canopy solar-absorbing oxygen-producing orchard-forest wild life supporting, 3-D polyculture versus 2-D agriculture (L.= 'field') & 'grass-roots' monocultures. Reverse engineering is the process of discovering the technological principles of a device, object, or system through analysis of its structure, function, and operation. It often involves taking something (a mechanical device, electronic component, computer program, or biological, chemical, or organic matter) apart and analyzing its workings in detail to be used in maintenance, or to try to make a new device or program that does the same thing without using or simply duplicating (without understanding) the original. Reverse engineering has its origins in the analysis of hardware for commercial or military advantage. The purpose is to deduce design decisions from end products with little or no additional knowledge about the procedures involved in the original production. The same techniques are subsequently being researched for application to legacy software systems, not for industrial or defence ends, but rather to replace incorrect, incomplete, or otherwise unavailable documentation.If we consider human-kind as an integral part of nature, there is nothing we invent, which doesn't carry nature's seed & DNA or inherent programming. Humanity, not understanding that all carry the same life programming, has adopted a fear of the other, attributing ill-will to others & the groups they belong to. Mohandas Gandhi's 'Satyagraha' (Hindi 'truth-search') assumes that all are coming from a place of best-intentions. It's true that in the complexity of our best intentions we plan & plot nefarious schemes, but underlying these schemes are a desire for equilibrium as well as a complementarity which balances the whole. Indigene Community approaches the task of social & economic design in Whole Systems Design by honouring inherent truths in existing institution, business, organization, government, structures & the accounting & governance tools which they employ. We appreciate they are designed with best intentions but are aware as well that like fish in water, or humans in air, we are unaware for many aspects of the system details in which we live in. It's important not to simply react against seemingly offensive or inefficient structures & components but of finding their complementary components. Referring to humanity's worldwide universal 'indigenous' (Latin 'self-generating') heritage helps us understand the operational roots of system components as well as the system paradigm. The design task becomes one of 'adding-value' to present structures so as to complete the circle of each component's intention. Both left & right political wings have good intention. Both left & right wings are needed to 'fly'. In order to complete the investing role of 'capitalism' (Latin 'cap' = 'head' = 'wisdom'), the inclusive multi-stakeholder desire of 'socialism' (Latin socialis “united, living with others,” from socius “companion”) is needed. Social enterprise needs the capital accounting cycle in order to recognize & empower stakeholders as decisional within the system. Indigenous 'caucusing' (Iroquois 'grouping of like-interests') empowers each stakeholder. Indigene Community is a collaborative project on compiling and implementing Indigenous Knowledge for sustainable development today. Please feel free to offer your experience, suggestions, resources, stewardship, direction and wisdom. MEANING 'INDIGENE' from the Latin means = 'self-generating' or 'generating from within' one's sphere of nurture and caring. ‘Indigenous’ goals of creating local inclusive welcoming interactive economies are not ‘race’ centered but reside in the universal human heritage for every peoples from every place on earth. 'Exogenous' from the L. = 'other-generated' or 'generated from outside' ones sphere of nurture and caring, implying imperial, colonial or stealing as a false means of livelihood sustenance. 'COMMUNITY' > L. = 'com' = 'together' + 'munus' = 'gift or service'. The words community, communication, municipality and remunerate are all derived from ancient practices of local accounting recognition for civil contributions. Indigene Community Essential Goods and Services Mutual-Aid provides socio-economic tools to communities who wish to animate their existing human and physical resources to provide livelihood for all citizens. Please add your comments to the 'Question and Comment box' at the bottom of each page, add email and send. Add any questions you may wish to pose, links you wish to make and other information you consider relevent. We consider Indigene Community web site a collective tool for those who are looking to reach back for indigenous tools of Whole System design. We are looking for active participants or those with any amount of information and energy to present. Our worldwide indigenous heritages are a huge overlooked area of research and public discourse alienated through colonial pressures. We will be adding a 'Blog' section so that participants will be able to make comments, develop subjects, add content and materials which will help in this compilation. If you are able to add sections in various languages, we hope to develop various languages to the site. left sidebar 'Index' 'Table of Contents' overview of 69 Sections & subcategories. attachments at the bottom of most pages, pictures and drawings go to each section. overview of indigenous science, social, ecological-economy and governance will consult subsection A. 1) The Indigenous Circle of Life text and the attached article. Search this site bar in the upper right hand page corner, by which you may search keywords of interest to you throughout the website. Questions & Comments box at the bottom of each webpage in which you can help guide the development of this Indigenous Knowledge for Sustainable Development compilation along its way. There is much more to compile. ménu a côté gauche pour regarder les 69 Sections et sous-categories. Pour voir les AFFICHES, photos et desseins au fond de chaque page. Pour ceux qui veulent un perspectif global sur des facteurs indigène scientifique, sociale, économie-écologique et governance doit consulter sous-section A. 1) Le Cercle de la vie indigène (aussi l'affiche en Française). Barre Search this site dans le coin droit en haut et faire enquête de vos interêts. Ajoutez vos Questions & Commentaires au fond de chaque page. 1) Please click on the Google DOCS link above in blue and download the above Google stored Power Point compressed document at 15.9 Mb. 2) Once downloaded as a ZIP file, then open as a Microsoft Power Point File. 4) then on the left hand side click on FROM BEGINNING or FROM CURRENT SLIDE. This will begin a 26 minute guided Audio Power Point Presentation of the 54 slides. 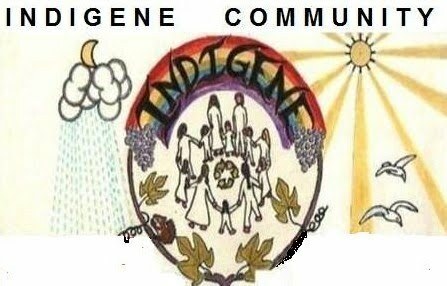 Indigene Community is a 'livelihood' based organisation. The economic and ecological well being of everyone involved and of the planet comes before all other causes. Indigenous Participatory and time-based Human Resource Accounting practices across Founder, Worker, Supplier and Consumer stakeholder Member contributions and Associations are counter-intuitive for those trained to think in only monetary capital, currency, accounting, collegial and communication terms. For those who take the time, it is an eye-opener or world-view changer. The PPpresentation is complementary to the indigenous economic and social concepts presented in the rest of this Indigene Community website. Included in the Slide Show once the Power Point Slide Show opens up in full screen with narration over 54 slides for 25.7 minutes. The left / right arrows as well allow you to navigate by choice from slide to slide. At the bottom of the screen is some volume control. The PPPresentation is timed over 54 slides during 26 minutes. Press the Escape key to exit at any time. The audio Power Point document is also attached under Section C. RELATIONAL ECONOMY, Part 2. INDIGENE PARTICIPATORY ACCOUNTING through Viewer mode with a descriptive list of the 54 slides. Non audio & reader-paced choice of slides is available by viewing in PPP mode. Please note that this website is under construction, still has many incomplete sections and corrections to make. Your feedback and contributions are most welcome! SVP notez que cet siteweb est en construction, avec plusieurs sections a accompli et corrections a faire. Votre réponse et contributions sont trés bien reçu! 1) Pressing on GOOGLE TRANSLATE MY PAGE, ALLOWS YOU TO TAKE TEXT POSTED ON THIS WEBSITE AND TO TRANSLATE IT INTO OTHER LANGUAGES AUTOMATICALLY. You must cut and paste those sections you are interested into the Google Translate. Please be advised, Mechanical Translation should always be verified by native bilingual speakers, however the service is useful as an assist. 1) GOOGLE TRADUCTION vous permettez de prenez les sections que vous desirez (coupez, faire copie et recopiez) traduire en Française où autre langage. ***Traduction présentement 6% en Française et 94% sont en Anglaise des affiches.